After reading Legend, book one of the Legend trilogy, it is apparent that protagonists June and Day trust each other. You get this sense from the first chapter of Prodigy, but reading the first book is crucial in understanding the establishment of that trust. In Prodigy, take everything you learned in Legend, break it apart, place the pieces into a basket, and dump the basket over choppy waters, watching as they disperse and possibly disappear. This does not mean that Prodigy is disorganized. It is not. It means that everything in June’s and Days’ world is shattered—dreams, illusions, memory, health, and love—everything except their trust for each other—perhaps. Over two months’ time, the story in Prodigy walks over and around that line between good and evil. June and Day have just escaped the Republic and are heading for the Colonies. They question each other’s motives and the motives of the people around them. Whom to trust? Should they trust the Republic or the underground and subversive Patriots? Trusting the Patriots, June becomes a double agent. 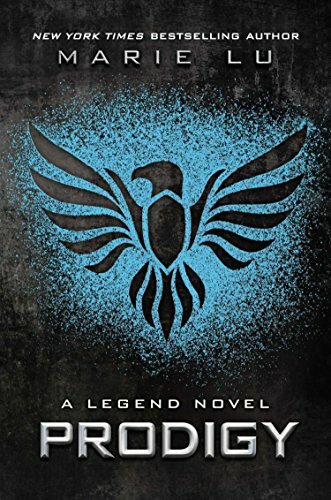 She tries to win the trust of Anden, the new Republic prime minister who takes the leadership position after his father, the prime minister in Legend, is killed. Her mission? To draw him in so he can be assassinated by the Patriots. “Well, I’m sure it is a different feeling from when that passing comes . . . unexpectedly.” He looks up at me right as he says the last word. I’m not sure whether he’s referring to my parents or to Metias—perhaps to both—but the way he says it leaves little doubt in my mind. He’s trying to say that he knows what happened to my family. And that he disapproves. “I know what your experience with assumptions is. Some people think I poisoned my father, so I could take his place.” It’s almost like he’s trying to talk to me in code. June considers what Anden is telling her: “If he actually wants to win over the people, if Anden is telling the truth . . . why would the Patriots want him dead? June ponders further her double agent plan. Can I trust Anden? Or do I trust Razor [A Patriot disguised as a Republic officer]? I steady myself against the edge of the table. Whatever the truth is, I’ll have to play this all very carefully. Day is not a double agent. Nor does he trust easily. He is an enemy of the Republic and assigned by the Patriots to assassinate the new Prime Minister. He is consumed with hatred for the Republic, because they have taken his plague-infected brother, Eden, away from him. Then I pass a marking that forces me to stop. A shiver runs down my arms and legs. I quickly jog back to see the marked railcar again, just in case I’d imagined it. Nope. There it is, embossed into the metal. The one I’d recognize anywhere. The three-lined X. My mind whirls—I see the red spray-painted symbol scarring my mother’s door, the plague patrols making their way from house to house in Lake, Eden being taken away. There’s no way this symbol could mean anything other than the fact that my brother, or something related to him, is on this train. All my interest in the Patriots’ plan goes right out of my head, Eden might be in here. I’m standing in front of a glass cylinder almost as tall and wide as the railcar, with smooth metal casing on top and bottom. It emits a very faint, blue glow. A small figure is lying on the floor inside, with tubes poking out of one of his arms. I know right away that it’s a boy. His hair is short and clean and a mess of soft waves, and he’s dressed in a white jumpsuit that makes him stand out against the darkness. Similar to those in Legend, the alternating June and Day chapters showing competing and comparable thoughts works; yet the writerly skills exhibited in Prodigy exceed those in Legend in that there is more depth and maturity to the characters. You will care more about them. After reading Prodigy, many questions will linger: Which Senators will side with Anden or will he be assassinated? Will Chian come back in book three? He runs the trials, but now that the trials have been abolished—what trouble will he give? Will June and Day be together or not? What comes of Eden, or Day, or June? Let’s hope book three ties up multiple loose ends. At the end of Prodigy, you will need to be led to the answers, some of which will induce sobs—heart-ripping sobs with ruby-studded tears. Just clear your calendar to allow yourself the luxury of reading this book in one or two sittings. You will be shaken—and book three will not come soon enough.